Fiona Whyte (pictured left): I wandered down to the delightful Paper Dress that evening very much looking forward to some stitching, a cup of tea and one of their notoriously huge slabs of cake. Being a relatively new Craftivist there were lots of people to talk to, some I recognised from other events put on by the Collective and many I hadn’t met yet. We settled down into the comfy sofas and discussed what we would each be stitching. We had decided to make some mini protest banners in support of the Robin Hood Tax. People had come along with some different facts, quotes and messages to stitch and inspiration sheets had been produced for those not sure what to write. There was plenty of talk about cuts, tax and bonuses. We talked about support for the robin hood, or Tobin tax being so high. The most popular tax in history? I had got a head start on mine and brought a quote from the governor of the Bank of England already stitched onto some fabric. I had gone with “Never has so much money been owed by so few to so many” Mervyn King paraphrasing Churchill’s famous “Never was so much owed by so many to so few” . I had stitched most of the wording on my train to work which had garnered a few more supporters of the tax as people asked what I was making and why. Despite finishing the quote there was still plenty to do and I’m by no means the fastest stitcher in east end. I had to attach my fabric to a backing (which hid all my stray threads) and choose some finishing off bits which included a Craftivist Collective label and a Robin Hood badge. It was only really once I was getting into the sewing that I started to think about our special guests of the evening: a crew from the French TV station Canal+. What would they be like? Would they want us to do anything special? Do I know enough about the Robin Hood Tax to answer questions I might be asked? A team of three arrived – presenter Alexandra, producer Carole and cameraman (eek, we can’t remember his name!). 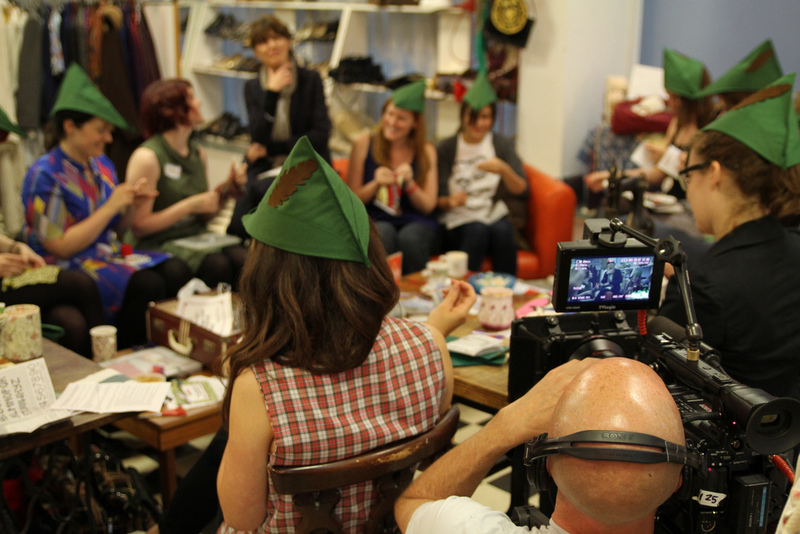 At the sight of cameras I went pink under my green felt Robin Hood hat. My fellow craftsters and merry women were also a little nervous so it was lucky for all of us that Alexandra and her team were professional and approachable. They thought the creative style of campaigning that Craftivist Collective used was really interesting and just wanted to hear more about it. 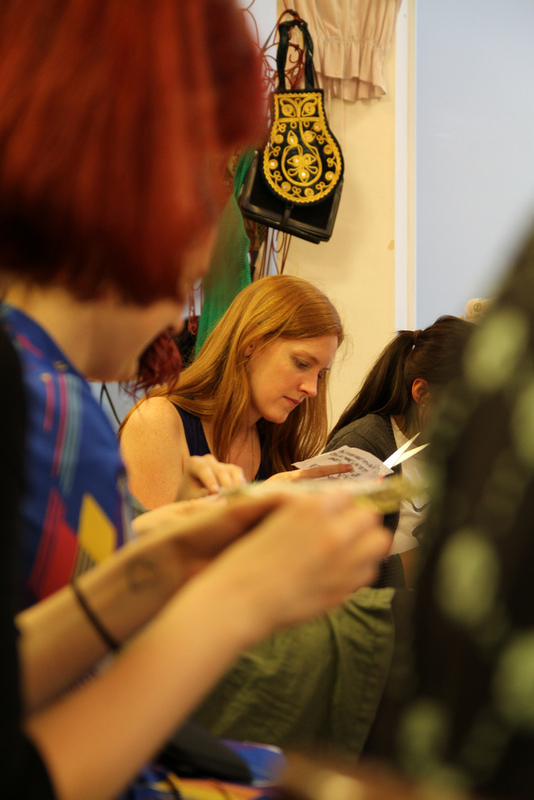 Founder Sarah Corbett gave Alexandra a run through of who the Collective were and what we did and we all filled her in on what had attracted us to the Collective and what we hoped to achieve with our craft. Finally we ventured back outdoors and down to Bank station, the perfect location for a mini protest banner on the RHT. Our band of merry women caused plenty of turned heads and smiles along the way. We found some great spots around Bank where we could attach our banners. Railings, benches and barriers were adorned with brightly coloured messages of greater equality, attached by cable ties – but only when we could be sure no one was looking! I think putting up your piece on display has to be the best bit of making the banners for me. Where should it go and why. By the time we finished filming the banners going up in the street it was late and we were all tired and hungry but happy from a great evenings craftivism. your evening looks great! I have been following the blog a little and I’m keen to join in, in someway although not really sure how yet.